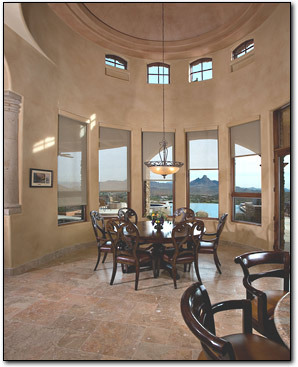 Solar screens are the most popular window shading solution. They offer great visibility, protection from harmful UV rays and cut down substantially on heat gain. Typically, screens are designed to roll up into a headbox or framed pocket providing a clean open look. They are available in a wide selection of colors, textures and opacities. We recommend a heavier opacity for direct East and West exposures. 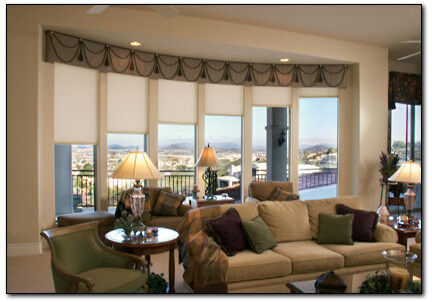 Roll shades are a great choice for many applications including: privacy, soft light, blackout and scene settings. When raised, they can disappear to attain a wide open look. Dual shadings have made roll shades even more popular as they offer two-in-one options such as a screen for day view with UV/heat protection and a privacy or blackout shade for the evening.